In the summer of 1998 I delayed my adulthood for ten weeks and backpacked throughout Europe, traveling with a number of hometown friends along the way. Toward the end of this journey, all my friends went home and I was traveling alone. I spent three days hiking and biking in the surrounding Jungfrau mountain region of the Swiss alps. The incredible natural beauty of the area, plus the sudden quiet of solo travel, was a once-in-a-lifetime experience. 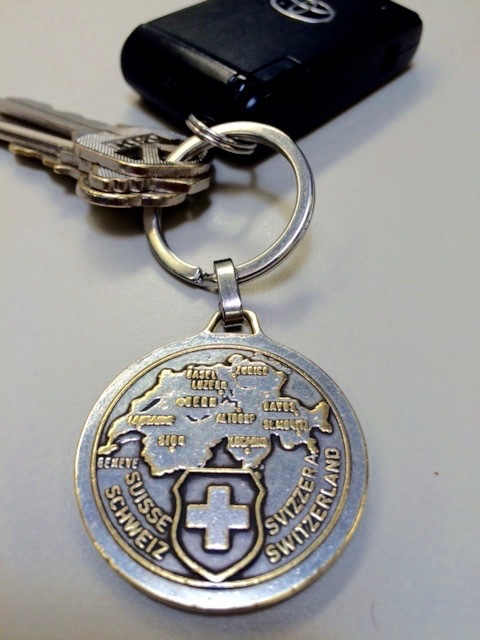 At some point during those last three days I bought this modest key ring medallion in a local shop. The front has a raised depiction of the three main peaks in the area, along with a Swiss shield with a splash of red color, and the back has a map of Switzerland. I’ve carried it with me for the past 18 years. It’s gotten a bit chipped and dinged up over that time, but then so have I. Aside from the medallion’s sentimental value, it’s also functionally ideal. It has just enough heft to feel sturdy, it’s just small enough to not overwhelm the other items on my key ring, and it’s circular, so it won’t catch or snag on anything. Perfect!